With academic and industrial experience in protein chemistry, neurobiology and cell biology, Greenbaum Patent is ideally situated to help you patent and commercialize your life science invention. Whether you have developed a research tool or you have designed a new protein, bioscience patents are some of the most valuable and specialized in existence. For these reasons it is critical that your patent agent has mastery over both the substantive scientific basis of your invention as well as the special issues that come up when prosecuting and commercializing life sciences inventions. The biotechnology industry is rapidly growing and rapidly evolving. 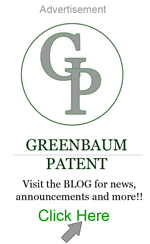 At Greenbaum Patent we help you to secure your market, by building a patent portfolio that stakes out your company’s territory and gives you exclusive rights to it, worldwide. As a start-up we help you do this quickly and cost effectively. Independent inventors, developing consumer products are the lifeblood of the American economy. Consumer products that fill a market need have enormous earning potential. The odds are, if you have developed an invention that solves a problem, other people with the same problem will want your invention. The consumer product industry has seen steady growth since the Industrial Revolution, and with the rising markets of Russia, China, and India starting to demand more commodities, this growth is expected to continue into the future.